If you haven't figured out by now, I LOVE making homemade ice cream! I was thrilled to see that we had ice cream slated for this week's Tuesdays With Dorie. Selected by Dolores at Chronicles in Culinary Curiousity, this recipe for blueberry sour cream ice cream sounded like a perfect summer treat. This recipe was really simple to prepare, as all you need to do is cook & puree the berries, mix in a combination of heavy cream and sour cream, chill and churn. I love this recipe as there were no eggs to temper...yippeee! I went with fresh blueberries, as my local markets are overflowing with them. I also went ahead and added twice the amount of lemon juice (really dig the tart flavor). Once assembled and frozen, I took a little taste test (okay, twist my arm! ;) )...YUM!!! Great thick, creamy texture, beautiful purplish/bluish hue, and a nice tangy flavor that comes from the sour cream. In many ways, this tasted like a frozen blueberry cheesecake filling. With cheesecake in mind, I decide to play with the recipe and made mini ice cream sandwiches. I paired the ice cream with a ridiculously easy graham cracker based cookie (the original recipe and my adaptation notes are below). To make these sandwiches, pour the just churned icecream into a 8x8 dish (or a loaf pan---that's what I used here) and freeze to set. - Drop dough by the teaspoon and bake until nice and browned - 8-10 minutes. For the sandwich recipe, halve the recipe and spread the dough onto an 9x13" pan or 1/4 sheet pan lined with parchment (very important as the dough is extremely sticky). Bake at 350 for approx 18-22 minutes, until the top is nice and golden brown. Note: I used an 8x8 pan for the cookies shown here, and the cookies came out a bit thicker than I would have liked. 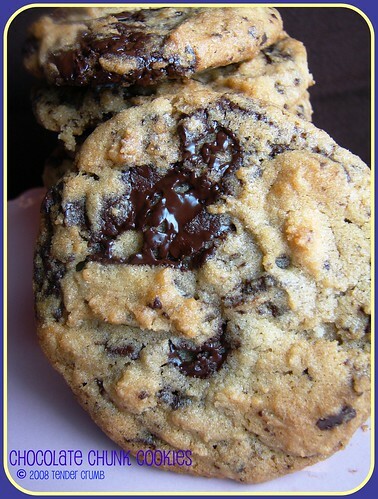 If you like thicker cookies, this should fit the bill; if you like your cookies thinner, definitely go with a larger pan. I cut the cookies and ice cream using a fluted round cookie cutter, assembled the sandwiches, and placed the finished sandwiches in the freezer to set. Keep in mind that the ice cream needs to be frozen solid when assembling the sandwiches and you need to work quickly, or you will end up with a melting mess. These mini cheesecake ice cream sandwiches tasted fantastic (it's another story on how these little guys looked :( ). The ice cream was the highlight in this treat, and this recipe will definitely be flagged for a repeat! 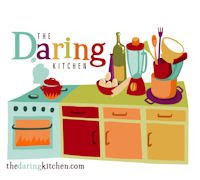 For the receipe, please head over to Dolores' blog. To see what everyone else churned, check out the TWD blogroll. Those cookies look amazing! I still have some ice cream in the freezer... I may have to try it out! I immediately thought if graham crackers too. Fantastic, and I love the images! I have yet to make an ice cream sandwich and need to hurry before summer is over. The fact that it was easy to make is a bonus. Oh. my. gosh. These look so delicious! Cookies from graham crackers - what a great idea. Great job!!! Oh man! These look amazing! I totally want to make ice cream sandwiches next time! I love lemon too and doubled it in mine. It was goooood. Great job! Absolutely love this! Those cookies look almost as good as the ice cream. What a terrific combination! This looks wonderful! I love what you did with those ice cream sandwiches! That looks fabulous! Great idea! graham cracker cookies, what a great combo! i wouldn't have thought of it, but it looks delicious. yum! your ice cream sandwiches are adorable. Oh what a grand idea. Yum! 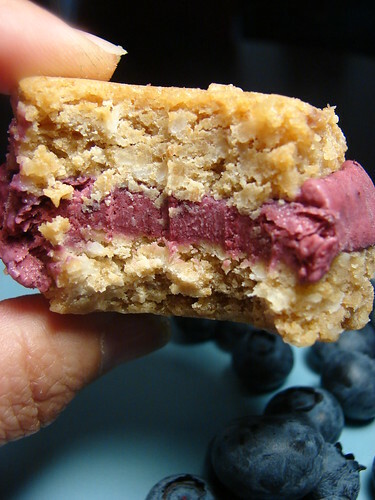 I love the graham cracker cookie idea! Sounds wonderful! 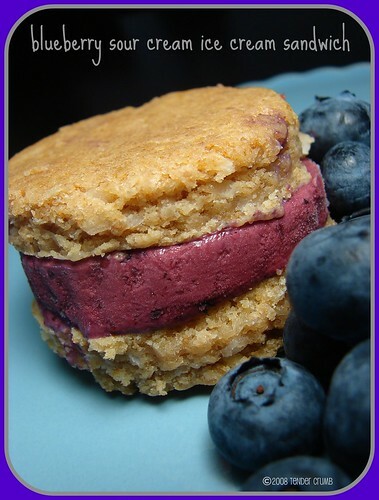 OMG, i love ice cream sandwiches and I've no idea why I haven't tried making them at home! Looking at your pictures is making my mouth water!!! I like the ice cream sandwich idea. 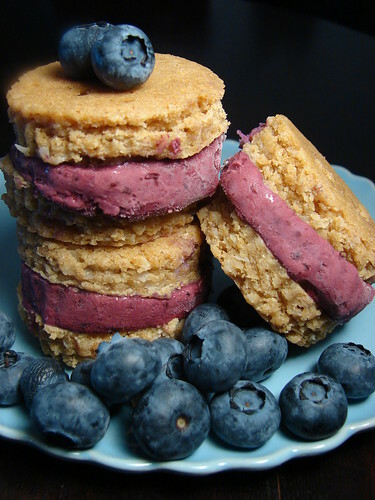 The graham cracker cookie makes a nice contrast with the blueberry ice cream. Are you serious!? Those look amazing. I am dying right now because I want one! mini frozen cheesecakes!!! utter bliss... amazing stuff. i'm drooling. that combo looks delicious. good lord. Your ice cream sandwiches look to die for! Very nice! SO adorable! I love the sandwiches! Oy...these sound FABULOUS! What a great idea and wonderful pairing. Excellent job. By day, I'm a corporate serf navigating the business jungle, but have sweet dreams of opening my own pastry shop. As I work on making my dream a reality, this blog provides me an outlet to share my passion for creating all things sweet (and some savory)! Your thoughts and comments are always appreciated!